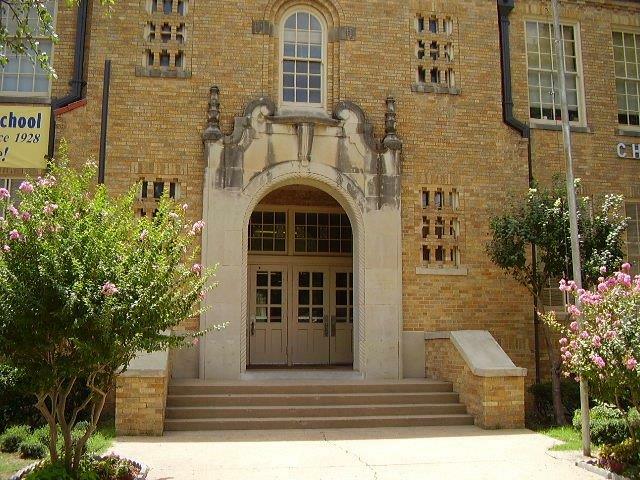 This Spanish Colonial style elementary school building was designed by Fort Worth Architect Wiley G. Clarkson. The school was named after Charles E. Nash, owner of Nash Hardware, and former secretary of the Fort Worth Board of Education. The original portion of the structure was constructed by Butcher & Sweeney and features an octagonal stair tower on the southeast corner of the building facing Samuels Avenue and Peach Street. In 1936, an addition was constructed to the north and it used the same detailing as the original building. It was designed by Earl T. Glasgow and constructed by Gurley Construction Co. Trustee Jacinto 'Cinto' Ramos, JR.